SUPERIOR COMFORT : These 5 pack Superior Soft Wool Socks have been specially designed to provide you with the ultimate warmth and comfort this winter season. MADE TO LAST: Making our novelty socks super comfortable is our top priority but it isn\'t our only priority. Crafted from 25% wool, 25% rabbit, 20% nylon, 17% acrylic fibers, 5% spandex and 8% polyester for a sumptuous feel, our bed sock, unlike other socks on the market have been made with double stiching to ensure durability for long term use. COZY FEEL: Slip these thermal socks on and will make getting out of bed on cold, dark mornings ever more bearable, and provide you with warmth to liven up those cosy nights indoors. 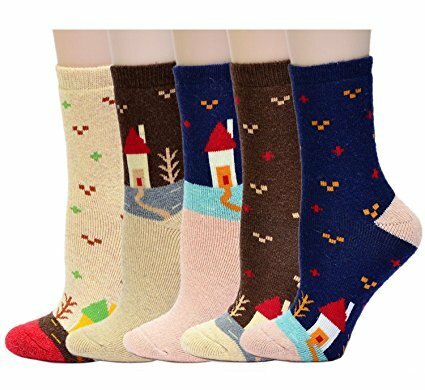 PERFECT GIFT: These winter socks are the best wool socks for skiing, hiking, office, school or outdoor in the cold season. Brilliant Christmas present for ladies , girls or boys! 100% Customer Satisfaction Guarantee or Your Money Back ! So warm and excellent quality.